On February 28 last year, Au Nok-hin posted a picture of himself on Facebook wearing a tuxedo, standing beside his bride. 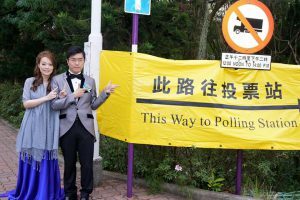 In the picture, the couple are pointing to a big yellow banner next to them that says: “This Way to Polling Station”. 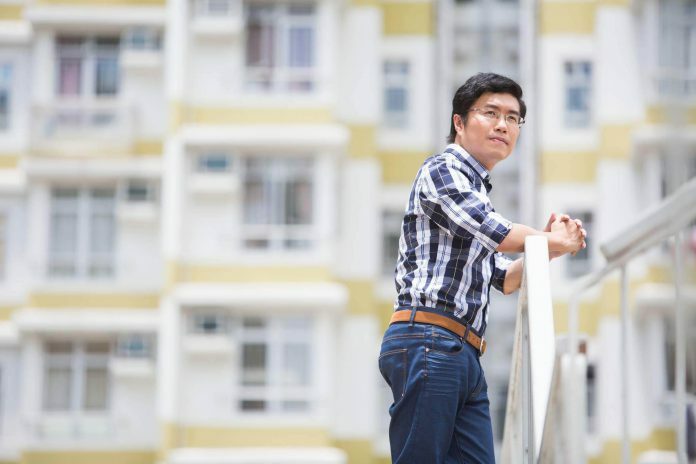 “I think I was an angry youth (fenqing憤青) when I was still studying in university,”says Au. Asked to define an “angry youth”, Au ponders a while before saying it should involve a sense of romantic idealism, the idea of a university student who cares about society and enters society to try to change it. Over the years working in the nitty gritty of politics, Au thinks he has learnt to temper his idealism in order to realise his ideals, while holding onto his pledge to “never forget the original intention”. Au having a meeting in the Southern District Council Secretariat. 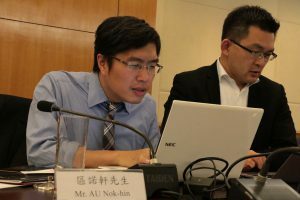 That role is as a connector between the Democratic Party and other pro-democracy forces and civil society organisations. He wants to help build a platform to help progressive forces to work together on common causes. It was in this spirit that he accepted the job as the convenor of the Civil Human Rights Front.